China just took a massive step forward for renewable energy as it flipped the switch on the world’s largest battery, which will help integrate a solar project and a wind farm into a smart grid. 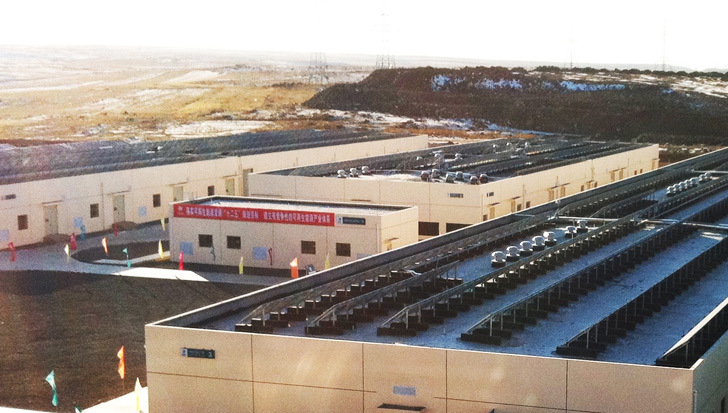 Capable of storing 36 megawatt hours of power and taking up the area of a football field, the giant battery bank was built as a joint venture between solar and electric car company BYD and the State Grid Corporation of China to improve a large wind and solar electric installation’s efficiency by 5-10%. It looks like we have a race to see who will have the largest battery in world as utilities struggle to make solar and wind technologies usable for longer periods of time. The battery bank utilizes similar technology to the 32 megawatt hour A123 system in West Virginia that opened late last year. BYD took their Ferrous battery technology designed for cars and strung thousands of small batteries together. The bank is fed by a 100 MW wind farm and a 40 MW solar project. It will smooth out energy production on the grid by storing power generated during spikes and peak production, distributing it when renewable energy generation goes flat, often only in the span of minutes. More useable energy is squeezed out of the system for use on the grid. The price tag for the project is equally impressive—at $500 million dollars a pop, we don’t expect to see many utilities lining up to adopt the technology anytime soon. But as the benefits of renewable power management become a key part of running a smart grid, we’re counting on a race to build even bigger battery banks in the future.